When it comes to hostess gifts, our own guests always knock it out of the park. We try to do the same in return, and as a Southerner, I was taught to never show up empty handed, which has prompted an ongoing mental list of go-to items to gift when we are invited to cocktail parties, dinners, barbecues, weekends at our friend’s homes or any other reason it is warranted to offer up a token of appreciation. Caldrea products for the home and body are a frequent indulgence. (So is Mrs. Meyer’s Clean Day, which you can read about in “Last Indulgence” on page 104.) The line includes aromatherapeutic household cleansers, hand lotions, candles, laundry products and housekeeping tools in a variety of gorgeous fragrances. The Basil Blue Sage Linen and Room Spray is infused with essential oils and freshens up the ironing, bed linens and every room in the house. I love to spritz it in all of the rooms after cleaning or right before guests arrive for a visit. As a gift, I’ll wrap up a bottle in a pretty fabric ribbon or fancy up a gift bag with tissue paper, twine or curling ribbon. The gift sets, such as simple hand soap and lotion in a ceramic or stainless steel holder, are beautifully packaged and the perfect marriage of form and function. Scented candles are a classic hostess gift. After living for many years in Texas, I’ve become partial to Tyler Candles (a Tyler, Texas-based company), which are highly fragrant and easy to spot by the sassy leopard patterned lids. Gordon’s in Metairie has a large selection. Place a few votives and holders in a fun bag or box and gift away. Stationery is the perfect hostess gift for your friends who enjoy writing letters and notes. 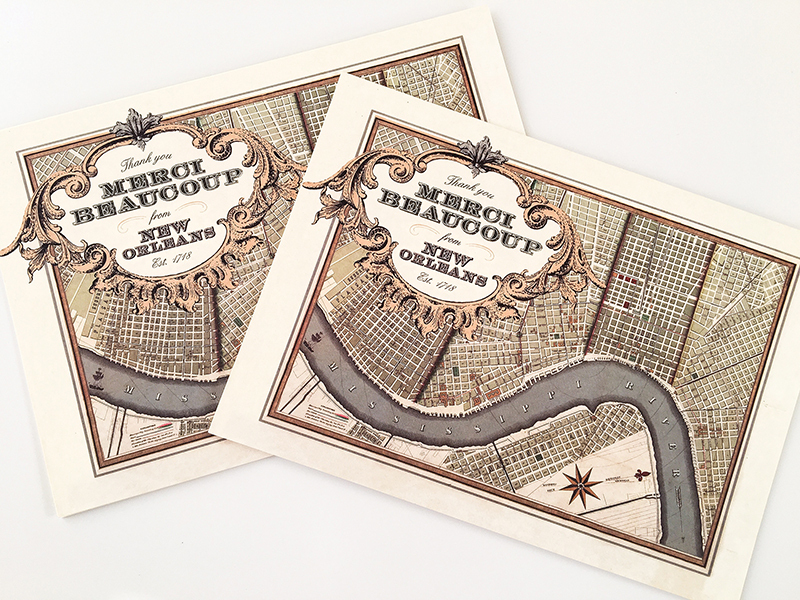 Scriptura has several charming New Orleans postcards. My favorite is the letterpress featuring a French Quarter streetscape. With grosgrain ribbon tied in a bow and perhaps a little sprig of rosemary or lavender, you’ll make a big impression. Coffee is a no-brainer for friends who are lovers of the bean. Community Coffee, French Truck and Orleans Coffee are my go-to Louisiana brands. A cute little scoop sweetens the gesture. Roux Royale in the French Quarter carries a fleur de lis scoop I own and gift. Fine tea is also lovely for those who prefer the leaf. Once after spending a few days in Mobile, Alabama with friends, I ordered custom monogrammed soaps from Mark and Graham (markandgraham.com). This is a couple we stay with often, so I wanted to do something a little special and with a personal touch. Art books, the aforementioned foods and beverages from home, chocolates and gourmet food items (olive oils, marinades, barbecue sauces and so forth) are also often in the repertoire. It’s best however to avoid fresh flowers, because your host or hostess will then have to take time away from their duties to place them in fresh water. Whatever you decide to give — large or small, beautifully packaged or in the brown paper bag from the store in which you acquired it — your host or hostess is sure to be touched by your thoughtfulness and invite you back again and again.